Closed Saturday and Sunday for family and faith. 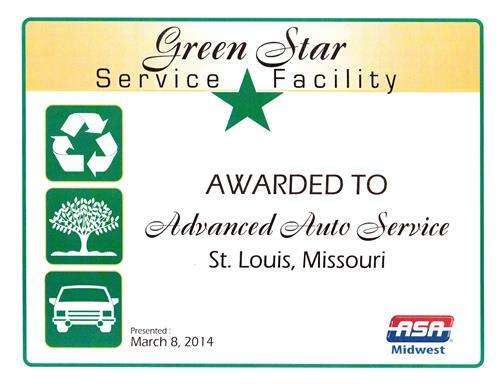 Advanced Auto Service has been providing top quality auto repair and maintenance services in St. Louis since 1957. We are family owned and operated and we are the second generation to run this shop. Our small shop has a strong reputation in the community and through all the changes in the area, we’ve remained a constant and reliable presence. We love serving drivers in our area with reliable auto repair that is done right the first time. We care about the area we live in, we work hard to keep the air quality good in our area and recognize the importance of safety and emission policies. There is a beautiful bright and sunny, and newly renovated park right across the street from our auto repair shop. It’s a beautiful place for customers to visit while they are waiting. Schedule an appointment today! Located in South St. Louis City, Half mile west of the Bevo Mill Restaurant or a half mile east of South Kingshighway and Gravois Ave. Across the street from Robert Leisue Park.